He Rautaki Matauranga mo Te Rohenga Tipuna o Hikurangi Takiwa, the hapu endorsed education strategy is now available to download from the Hikurangi Takiwa Trust website. Hikurangi Takiwa Trust’s draft Economic Development plan is now available for hapu members to provide feedback on and input further ideas. Access the plan via the Rauemi page. 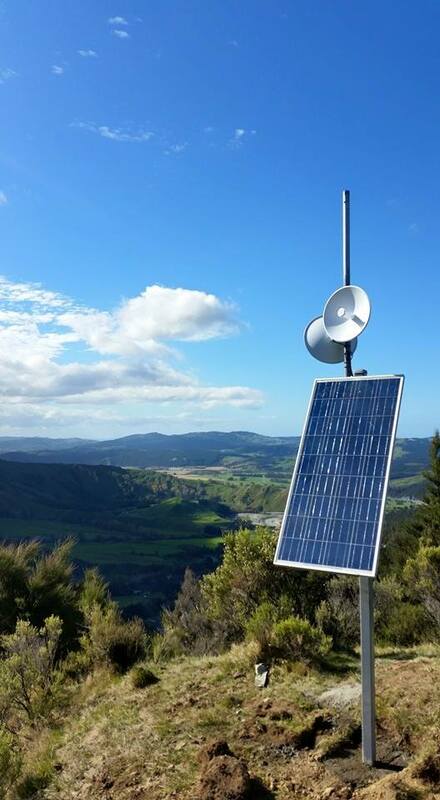 Freshly installed Horehore / Makarika – Ruatoria radio wifi repeater owned by Evolution Wireless. A hui hosted by Hikurangi Takiwa Trust was held at Kariaka Pa on 31 August 2015 to identify priority digital developments for our part of the world. With representatives at the hui from Te Araroa to Te Puia, the meeting notes were circulated to a wider group of East Coast residents for additional input. Community Technology Hubs provide valuable opportunities for local residents who do not have internet access at home to have a relatively easy access option, with support to develop their confidence and skills. Community Technology Hubs provide people with opportunities to better understand the potential of internet access to make their lives easier – particularly in terms of communication with family, friends, businesses (especially banking, utilities and other services) and public services (Council, health services, WINZ, IRD, etc.). Community Technology Hubs can also be used as tourist visitor centres with information on local attractions, accommodation, food retailers. identify the potential host organisation that is already or could support one or more part-time staff members to provide training and support to users, and visitor information services. Information contained in the GDC submission to MBIE for the digital enablement EOI was inaccurate and misrepresented the reality of the situation for households, service providers and businesses on the East Coast. It needs to be corrected as it formed the basis for the bid and significantly over-claimed existing coverage. A significant barrier to more affordable internet access is lack of knowledge about what services are available for what price. A roadshow around Coast communities – probably through school and marae – could provide independent advice and information on options for home and business internet access (including ISPs products, phone/internet boosters, etc. ), as well as engaging communities in discussions on digital development priorities and consultation to identify current blackspots in radio WiFi and cellular coverage. Significant costs are associated with establishing a new connection on the Coast because new physical infrastructure is often required in the form of a radio repeater – these usually cost $2-3,000 per repeater. To reduce the digital divide, residents should pay the same for establishing and maintaining internet connections regardless of where they live in the region. Subsidies for new rural broadband connections would reduce the current disparities that mean those in the highest deprivation areas pay the highest costs to access the internet. The Mind Lab is difficult to access from the Coast – both in terms of travel distance and cost for holiday programmes, etc. Is it serving the district equally? If not, what will be done to reduce the inequalities in access to this important and heavily subsidised resource for students, teachers and whānau? Access to technical support is more costly for the Coast because technicians servicing private homes, businesses, education and health providers and community services have to pay extra for travel time and mileage to have their machines serviced. How can we support technical support closer to where it is required if the critical mass does not yet exist? There are mixed messages about how much the fibre running around the Coast can be utilised by communities and facilities. We need accurate information on the possibilities and opportunities to utilise this vital piece of infrastructure for businesses, health and education providers and homes – especially those in close proximity to SH35 and the fibre cable installed by FX Networks. Significant opportunities exist for cultural and business development if more investment is made in things like Code Clubs, Te Reo resources, basic technology skills, telehealth services, bee-keeping technologies, etc. The pilot project Ivan Lomax has undertaken with Tolaga Bay Area School to utilise their high speed connection for homes in the vicinity and sending data via a repeater on Titirangi has a lot of potential and Ministry of Education has explicitly encouraged schools to use their connections for community benefit. This need more support and a project focused on the potential for this solution to be implemented around the region. Hicks Bay, Te Araroa, Tikitiki/Rangitukia, Ruatorea, Waipiro/Te Puia Spring, Tokomaru Bay, Tolaga Bay.